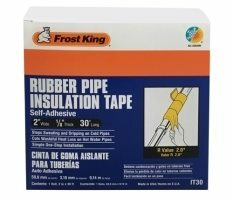 With Frost King Natural Cotton Insulation, you don?t need gloves, a face mask or goggles - it?s completely safe and easy to install, yet provides maximum insulating power. Cut it, rip it or just fit it into your ducts, walls or anyplace that needs a quick bit of insulating. Made from recycled Denim. It comes in different sizes and lengths to fit your needs.